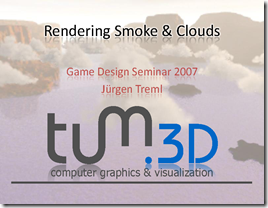 In February 2008 I was required to deliver a talk on the topic of ‘Rendering Smoke & Clouds’ during a university course on game design. As a matter of fact, in the end, this talk did almost exclusively focus on clouds but many of the principles described during the talk apply to smoke as well. Anyway, major differences between smoke and clouds exist if we’re talking about animating them but rendering is basically the same. During my talk I covered topics from the creation of clouds and the actual rendering to animating them. The latter one I kept quite short though. Besides I gave an overview on the physical principles behind as well as the formation and dissolution of clouds plus information on a few less physically founded approaches such as random noise and especially Perlin noise or artistic methods involving computer aided design by humans. These documents as well as further talks on the topic of game design can also be found at the universities course homepage here. Last but not least, keep in mind that this talk is neither a physical dissertation on cloud dynamics nor a how-to on implementing a cloud rendering engine. It’s meant to give a short overview on the current state of the arts regarding this topic. If you’re looking for details, there’s a references section at the end of the summary paper which will guide you to the original sources of any of the techniques described.